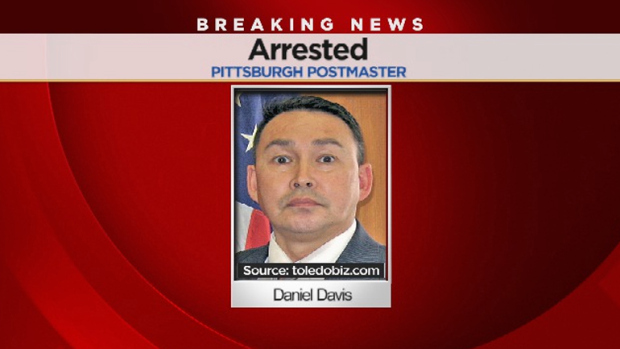 PITTSBURGH (KDKA) — The postmaster in Pittsburgh has been arrested on charges of opening mail packages allegedly looking for drugs and threatening employees if they told authorities about it. Officials say Dan Davis is accused of illegally opening express mail packages. According to the criminal complaint, Davis would run Google searches on the addresses on packages. If an address came back invalid, he would open the package. The criminal complaint reports that he claimed he was searching for drugs and money. “He explained he was looking for drugs. He said where I come from we took drugs off the street,” Allegheny County District Attorney Stephen Zappala said. Davis is also accused of telling co-workers who saw him opening the packages not to say anything, and, at times, the criminal complaint alleges, he threatened their lives. Daniel P. Davis, 50, of Canonsburg, was charged by the Allegheny County district attorney’s office with intimidation of witnesses or victims, criminal coercion and official oppression. The charges relate to one of those employees, identified as Mavin Parker, the U.S. Postal Service’s manager of customer service in Pittsburgh. Detectives wrote in an affidavit that Mr. Davis threatened several subordinates — telling one, Donna Clay, a customer service supervisor in the Hazelwood office, that he would kill her — who had become aware that he was opening express mail packages at locations throughout Allegheny County. Only the East Liberty station is mentioned in the paperwork released today as the site where Mr. Davis allegedly opened packages in violation of postal service regulations. Mr. Davis has been the subject of investigations by both the DA’s office and the federal Office of Inspector General. It was unclear early today whether Mr. Davis was in custody and whether there might be any federal charges pending. These sickos are the type of people the Postal Service loves to promote. Another PCES employee who thinks they are above the law. He EOD date is 1997, so he moved up very quickly, along with his ego. His POOM and Accomplice Maureen Gerst also??? The guy was a tyrant in Toledo. Glad to see that karma is finally catching up with him. It is a part of the job that should NEVER exist. I have PERSONALLY heard him threaten postal employees at a previous station…because I was there when he introduced himself to the station I was at. That type of behavior in the workplace is inexcusable from anyone. It is bullying — plain and simple. If he were a carrier and tried that or opening packages (which he is NOT allowed to do), I can guarantee you that the punishment (not discipline) would be swift. He is not above the law or the procedures of the USPS. He should be fired. Davis was up here in Rochester NY for a few years. He was in constant trouble for harassment and sexual harassment. He even was fired once for it. He got his job back claiming racial discrimination. The fact that he ended up in charge of Pittsburgh is disturbing. But same USPS sop. They share similarities with the Catholic Church. His knees are still hurting. I hear he’s on admin leave, so he’s still getting paid. Most people that threaten others don’t get a long paid, vacation. Besides, he has a lot of money stashed from drug dealing.